Udderly Fresh Soaps have made it their mission to make a difference in peoples lives by creating and sharing natural skin care products that help everyone; especially people with dry skin or sensitive skin. Udderly Fresh creates and sells goat milk soap, natural shampoo, natural lotion, natural laundry soap, natural lip balm, natural salt scrub, natural insect repellent and natural dryer sachets. Their products are all handmade with pure & natural ingredients that are healthy for your skin and the environment. They use only the most healthy ingredients in our products including pure essential oils, fresh herbs and fresh goat milk. 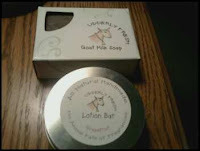 I received Udderly Fresh Patchouli Goat Milk Soap and Grapefruit-scented Lotion Bar for review. The Goat Milk Soap has a lovely natural scent with Clove, Lime, and Patchouli essential oils. It is refreshing a soothing. The Grapefruit Lotion Bar is a bar that comes in a cute little tin but you simply use it like lotion and rub it on any dry parts of your body or between your hands. It is made with beeswax, coconut oil, shea butter, and grapefruit essential oil. I love that Udderly Fresh's products are all natural and handmade. I am realizing how important it is to use natural products on our bodies instead of toxic and harmful ingredients. Plus it is good for the environment too. Udderly Fresh is a great company with good products and cute packaging. 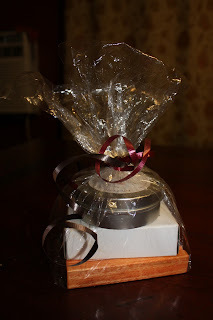 If you are looking for natural gifts for your loved ones, check out Udderly Fresh and support a small business as well! 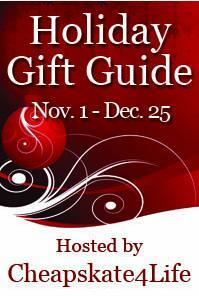 Win It: Enter here to win a Holiday Set (Peppermint Soap, Peppermint Lotion & Soap Dish) from Udderly Fresh! Mandatory Entry: Visit Udderly Fresh, then come back here and post a comment telling me who you would give this Holiday Skincare Set to if you win! I would give this set to my mother if I win.